One of the things that perhaps a lot of us don’t openly talk about in Singapore is the topic of plastic surgery. Unlike folks in South Korea — where it is common for people to undergo cosmetic procedures — the subject is still pretty much taboo among Singaporeans. And because of this, those who’ve gone under the knife aren’t as willing to talk about or review their experiences, making information about surgical procedures and reviews on doctors here in Singapore scarce. Someone keen on going for a cosmetic procedure would have to rely on word-of-mouth or referrals to help in their decision-making process. To change that, and to tell everyone that it is okay to discuss plastic surgery in Singapore, the trio of Sandy Kuan, Lester Chia and Edward started a plastic surgery portal PlastyTalk in Singapore. “Sandy is the one behind the idea. She was researching for some procedures and she had to search all over the web for reviews and information about the doctors. She realised there should be an easier way to do research, to read up about particular procedures, read up on doctors, so she decided to set up this portal together with me and our other partner,” Lester shared with Vulcan Post. 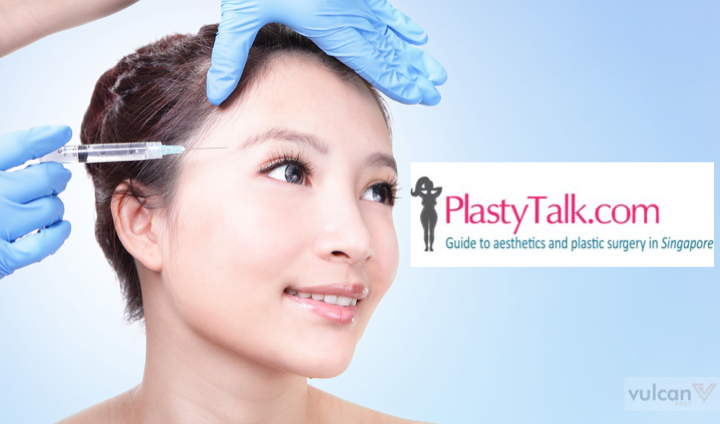 First started in December 2014 as an experiment, the site quickly grew to attain their current 72,000 pageviews a month — a healthy growth that proves that Singaporeans do look for plastic surgery-related information and news. Of course, a majority of the traffic is driven by its news content, a section where PlastyTalk highlights notable examples of Singaporeans who allegedly went for plastic surgery. 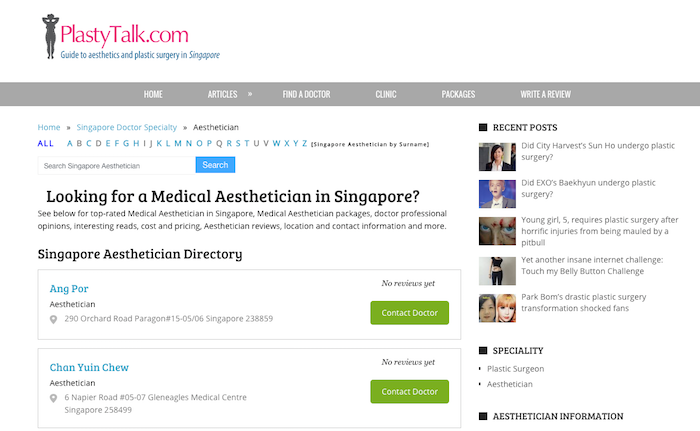 Other than that, the platform also allows you to do research on and find aestheticians in Singapore. “We want to bring transparency to a non-transparent industry in Singapore, to bridge the gap between people looking for information and reviews regarding a doctor and the scattered information online,” added Lester. You can search for aestheticians on PlastyTalk. Lester may be a professional emcee himself, but entrepreneurship and starting up is nothing new to him, with PlastyTalk being his third one. He started his first company Gastro Couture back in 2011, which was a website that helped restaurant owners fill up empty tables by providing discounts to customers who made their reservations online. That didn’t work out due to a lack of traction, so Lester moved on to his second venture Happybox in 2012, which offered themed gift boxes to you or your friends. While Happybox has also ceased operations, Lester and his team revealed that PlastyTalk is currently receiving good response. “Our vision is to be the SgCarMart for the aesthetics and plastic surgery vertical in Singapore, and later the region,” shared Lester, citing that the team is closely modelling upon the successful car classifieds and forum SgCarMart. In terms of conversion, PlastyTalk has to date sent leads to doctors who have converted about S$100,000 worth of procedures — not bad for a newly launched website. In an age where Singaporeans are getting more affluent, there’s definitely a growing market for people who are willing to pay to look more attractive. In 2013, Yahoo Singapore spoke to South Korea-based plastic surgeons and found that the number of Singaporeans visiting them in the past year have “tripled or more”. Specifically, Gangnam-based plastic surgeon Choi shared that he consults about 1 Singaporean a month, and that they are Singaporean women of varying ages.